Angel Pagan argues with the Rockies' Nick Hundley. SAN FRANCISCO — On many nights over the last two years, the Giants have walked back to the clubhouse muttering about Nolan Arenado. On many nights over the last three months, the Giants have walked back to the clubhouse muttering about a blown lead. On Tuesday night, they did both. Arenado hit a go-ahead three-run blast off reliever Cory Gearrin in the seventh in what truly was a marriage of ongoing Giants issues. The homer was Arenado’s 14th against the Giants in the past two seasons and gave him an astounding 21 RBI in 12 meetings this season. The blown save was the 17th for the Giants bullpen, tying them with the lowly Reds for the most in the Majors. The Giants lost 7-3 to the Rockies. All of this on a night that started with another familiar storyline: A dominant Madison Bumgarner. A day after Jake Peavy was giving thanks to Mac Williamson, Bumgarner was the one searching for the rookie right fielder in the dugout. Bumgarner went in with a bear hug when Williamson got back from a huge sliding catch at the end of the third. With the bases loaded and two outs, Trevor Story hit a fly ball deep to right. Williamson, on a dead sprint, made a sliding catch right on the chalk, potentially saving three runs. Angel Pagan made sure Bumgarner had an early lead. Pagan reached on an error in the first and motored home on Brandon Belt’s single, and his leadoff triple in the fifth set up a second run. 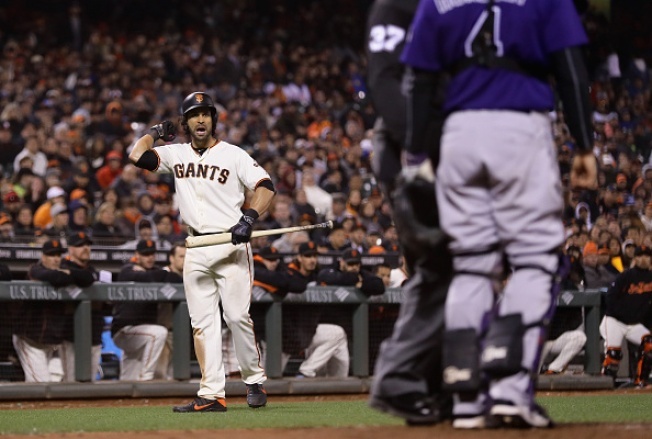 The Rockies stormed back in their first inning not facing Bumgarner. The first two batters of the seventh reached, and Mark Reynolds scored from third on a two-out infield single. Arenado got a 2-2 slider from Gearrin and blasted a no-doubter to left, wiping away Bumgarner’s hopes of a 10th win. The bullpen would give up three more runs in the eighth. Starting pitching report: Bumgarner had a light workload by his standards, throwing just 96 pitches. He has been under 100 pitches just three times in 18 starts this season. The (relatively) brisk night sets him up to come back Sunday and pitch the final game before the All-Star break. Bullpen report: Hunter Strickland didn’t fare any better than Gearrin. He entered with two on in the eighth and gave up three straight singles before walking DJ LeMahieu with the bases loaded. At the plate: Bumgarner drew a walk in his first at-bat, his fourth in his last five starts. He already has set a career-high with six walks. In the field: Williamson followed the first highlight reel catch with a Superman catch in the eighth that was eerily similar to the play he made Monday. Attendance: The Giants announced a crowd of 41,753 human beings who spent five minutes trying to figure out what the heck happened between Pagan and Rockies catcher Nick Hundley. Up next: Johnny Cueto makes his final appearance of the first half. He’ll take a 12-1 record into a matchup with lefty Jorge De La Rosa.